To do what you love is a life lived for real. Aspirants of competitive exams study day and night to fulfill their dream of achieving the best positions in their career. They all want to do something and everything which interests them and help them to grow. 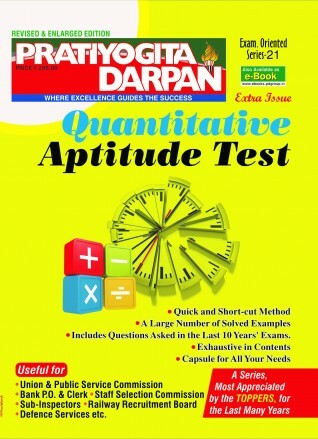 Quantitative Aptitude test magazine by Pratiyogita Darpan has become a bench mark for the aspirants and it is helping them to excel and transform their dreams into the reality. This magazine is a well structured knowledge bank for the topics like arithmetic, algebra, trigonometry and geometry. It is highly useful for the examinations like UPSC, Bank P.O & clerk, staff selection commission, sub inspectors, railway recruitment board etc. These topics are well elaborated with examples as well as questions with practice. The more students will practice the more results will be better. Arithmetic is comprised of sub topics like calculating average, time and distance, area, numbers, decimal fraction, unitary method, squawroot and cube root and many more. Algebra is comprised of sub topics like simple formulae and their application, logarithms and their use, factors, L.C.M and H.C.F, surds and indices, quadratic polynomials and quadratic equations etc. Trigonometry is comprised of sub topics like circular measure, radian and trigonometrical ratios, trigonometrical ratios of sum and difference of two angels’ etc. Geometry is comprised of triangles, similar triangles, quadrilaterals, locus, Pythagoras theorem and its applications etc. Deep and clear knowledge is bound to touch the heights of success; aspirants are just required to keep a positive attitude. Best part about Quantitative Aptitude test magazine is that it gives ample space for practice. Examples and formulae in the magazine by Pratiyogita Darpan are given in a very simplified form which has made it easier to understand the problems and their solutions. Each topic is well defined with examples, and are given with all the possible methods to solve them. It certainly helps the aspirants to keep on practicing more and more because it also develops huge interest in the subject.